The Runnin Royals proved they can win without running Saturday afternoon, closing on a 15-4 run to thump Randolph College at home, 72-68. In a contest ripe with storylines, Eastern Mennonite broke out of a four-way tie to take sole possession of fourth place in the Old Dominion Athletic Conference (ODAC). EMU entered the day tied with Randolph, Hampden-Sydney and Bridgewater for fourth in the league standings, but all three of them lost. The men now have a win over each of those teams muddled in the middle of the ODAC pack. The visiting WildCats, hamstrung with a healthy roster lacking in height, executed their game plan as designed, shutting down EMU’s All-ODAC big man, David Falk (Madison, Va./Madison County), by swarming him with defenders every time he touched the ball. Randolph also got back on defense after every shot attempt, resulting in a halfcourt game with a combined two offensive rebounds and six fastbreak points. How would the up-tempo Royals handle that type of a game? Eastern Mennonite responded by running their offensive sets and finding the open man. They shot 12-of-23 from the floor in the first half, including 6-10 from outside, to take a 36-34 lead into halftime, thanks to an inside jumper from Marcel Crump (Richmond, Va./Highland Springs) in the closing seconds. Randolph was almost a mirror image, shooting 12-for-25 with 5-10 from three point range. The second half was just as tight until the WildCats scored nine straight points to build their largest lead of the day at 52-43 with 11:19 to go. Behind some hot shooting from freshman Jerome Jones (Charles Town, W.V./Washington), the Royals stormed back to within four points, but Randolph wouldn’t give up the lead. The visitors matched EMU shot-for-shot, leaving the lead between four and seven points until the game hit a pivotal moment with 5:04 remaining. With EMU on offense, Falk jumped to gain possession of a loose ball. As he came down and turned, he collided with a Randolph defender and was whistled for elbowing and tagged with his fourth foul. The home crowd sat in disbelief and Coach Kirby Dean was livid. The WildCats calmly went into their offensive set, drew a foul and connected on both free throws to put the lead back at 64-57. The five Royals on the floor, however, decided it was their time. Ryan Yates (Alexandria, Va./T.C. Williams) hit a jumper to trigger a run. Falk swatted a shot to start a fastbreak, which Yates converted to slice the deficit to 64-61. After a defensive stand, James Williams (Capitol Heights, Md./Archbishop Carroll) found Jones for another three ball, this time knotting the score at 64-64 with 2:52 left and igniting the home crowd. After another big block from Falk, EMU’s big man hit a jumper in the paint to put EMU in front for the first time since the 17:31 mark. Randolph looked rattled and turned the ball over on their next two possessions, leading to a knockout punch from Williams. The point guard sliced into the lane for the hoop and harm, converting a three-point play to push the lead to 69-64 with 16.1 seconds left. Williams’ effort capped a decisive 12-0 run, as the Royals clamped down Randolph for a stretch of 4:34 in the final five minutes of the game. The final seconds were packed with WildCat layups and EMU free throws, but the men went 3-4 from the stripe to seal the key 72-68 win. The teams combined to shoot 50 percent from the floor and 54 percent from long range. Eastern Mennonite was 24-47 in shooting, including a season-best 10-17 from three. Randolph shot 24-49 overall and 10-20 from outside. The Royals made the difference up in quantity at the free throw line, hitting 14-21 compared to 10-11 for the visitors. Jones made Randolph pay for every open look he got, burying 6-of-7 three pointers for a career high 22 points. Williams picked his moments and was 6-6 from the free throw line for 14 points. Yates hit a trio of threes and added 13 points. Falk had a game high nine rebounds and three blocks. Crump turned into a distributor with a career high eight assists. He previous best was four handouts. Reid Jacoby led a balanced Randolph attack with 14 points, as he hit four treys. Zach Desgain had 13 points, six assists and five rebounds. Jason Eddie added 12 counters. 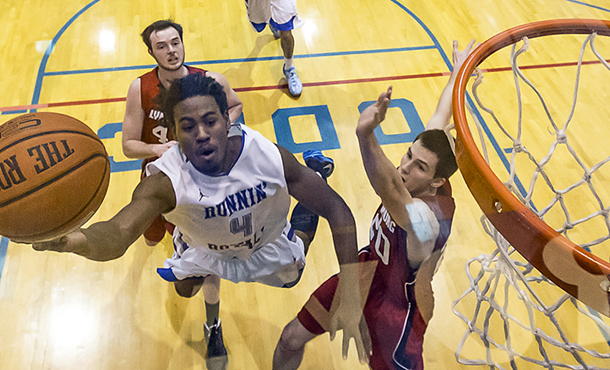 The Runnin Royals are now 12-5 overall and 5-3 in the ODAC. Randolph slips to 10-7 and 4-4. EMU stays at home on Wednesday to host Shenandoah, who just earned their first ODAC win of the season in an overtime effort over Hampden-Sydney.